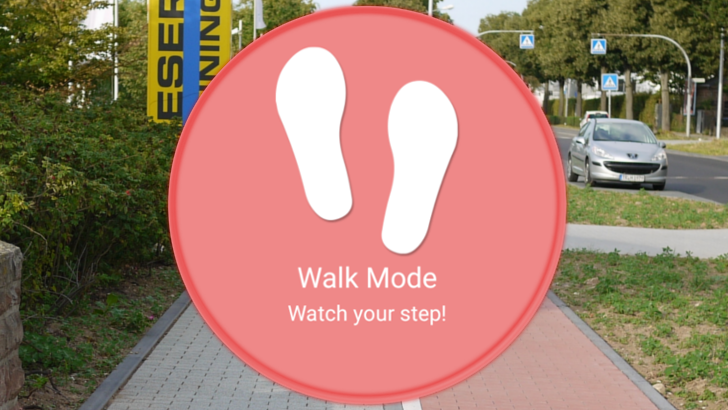 Recently, Samsung's Indian R&D released a new app called Walk Mode. 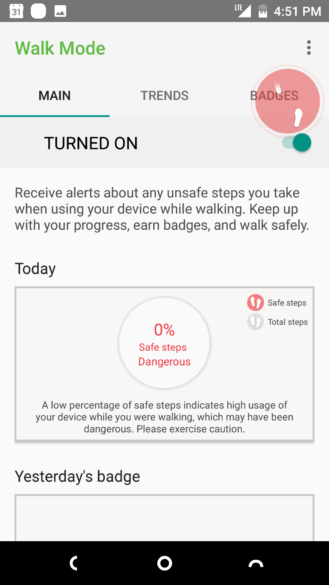 It's advertised as notifying you if there is a danger present as you go about your business using your phone while walking. 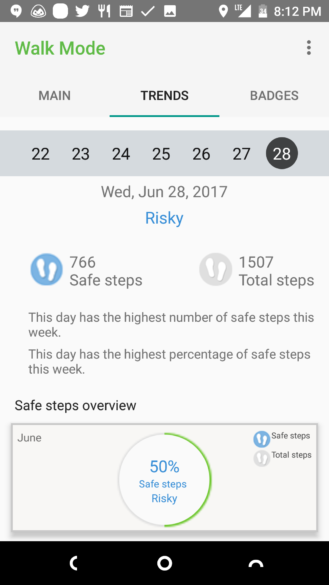 Safety is quite a noble endeavor for Samsung to be pursuing, and I'd like to say that the company's efforts paid off, but I would be lying. This particular app release may have flown under your radar, as so far it is exclusive to India. But rest assured, dear AP readers, that mere regional locks will not prevent the intrepid reporters at Android Police from testing anything, anywhere. I found out about this app today, though it's been available in India since May. And, being a city-dweller, I thought it might come in handy. Setting up the app is pretty easy. On the first launch, it requests a laundry list of app permissions, and when things are ready to go, it drops you in the main menu of the app. From here you can turn on or off Walk Mode. When it's enabled, you have a persistent notification that it is running. 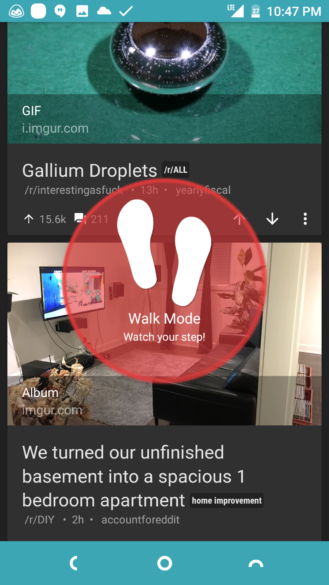 The first thing you notice when you turn on Walk Mode is the overlay it places on your screen. Initially, it shows steps in a sort of floating notification in the corner. I thought this might just be an indicator that it was working, but after a few moments my phone started vibrating, and the tiny notification turned into a giant overlay, taking up most of my screen. Startled, I looked around to see if my phone had noticed something I did not, but I was entirely safe. You see, the implicit premise behind the app isn't that it can detect when you are walking and may be in danger. All the sensor data is, basically, a farce. It actually assumes that any use of your phone while walking is danger in itself. If you zip down to the local bar, and on your way, pop open Reddit to take a look at the recent market trends in dank memes, Walk Mode will notify you that you shouldn't do that. Even worse, the overlay also interferes with interaction. So if you were doing something when it decided to give you the full-screen warning, you now have to spend even more time trying to accomplish whatever it was. For an app concerned with safety, I won't say that interrupting a user to make their current task more difficult is entirely counter-productive to the idea of safety, but I will say that it's definitely not a good way to warn someone of the obvious. Although I granted the app all the permissions it required, and even gave it access to an extra "High accuracy " GPS mode, and "Horn detection alerts" that ostensibly used my phone's mic to detect car horns, none of that made any difference. 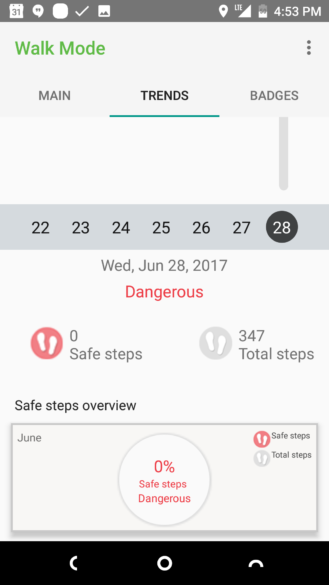 All I got for my efforts were repeated warnings to "watch your step" anytime my phone was on, and it sucked my battery dry. Thankfully, my frustration led to me putting my phone away for a long enough period of time to bump my walk rating from "Dangerous" to "Risky." The app has all sorts of gamification to try to motivate you into using it, like badges and statistics meant to show your improvements over time. But, all of that is pointless in the face of an app that considers abstinence from use while walking as the only safe use of a phone. So, if your idea of sidewalk safety is to just not use your phone, you can probably save a ton of time, frustration, and battery life by just not using your phone, and skipping this app entirely. It serves no benefit short of stating the obvious, and all the permissions and features it claims to possess, like horn detection and sensor usage, are functionally useless. If you're a tremendous masochist, or really hate things like battery life and basic functionality while using your phone, feel free to give it a shot over at Google Play. Though, you'll have to be in India to install it. And, if you aren't in India, like having a phone that works right, and can restrain yourself while you are walking, then continue on with life as is. You're a lot better off without it.